Brief：President Xi Jinping held talks in Bishkek with President Almazbek Atambaev of Kyrgyzstan. The two heads of state announced to upgrade China-Kyrgyzstan relationship to a strategic partnership. 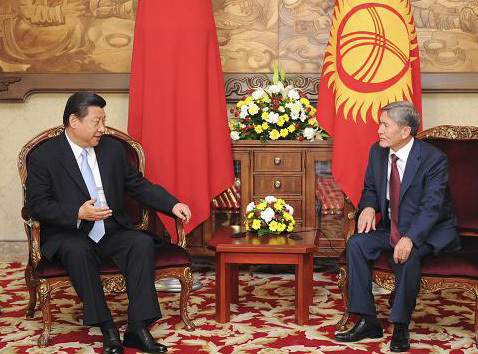 On Sept. 11, 2013, President Xi Jinping held talks in Bishkek with President Almazbek Atambaev of Kyrgyzstan. Both sides had a candid, in-depth exchange of views on developing China-Kyrgyzstan relations, deepening bilateral cooperation and reached important consensus. The two heads of state announced to upgrade China-Kyrgyzstan relationship to a strategic partnership. Xi Jinping pointed out that China and Kyrgyzstan are mutually dependent as well as share weal and woe. Our greatest wish for bilateral relations is to hope for long-term good-neighbourly friendship. It is as well the common aspiration of the two peoples. The establishment of strategic partnership between the two countries is a new milestone in the China-Kyrgyzstan relations and is of great and far-reaching significance. Both sides should support each other in the political sphere, work closely in the security field and cooperate for mutual benefit in the economic sector, so as to build the China-Kyrgyzstan relationship into an example for relations between neighbouring countries featuring equality, trust, cooperation and win-win outcomes. Xi Jinping stressed that China supports Kyrgyzstan for following the development path chosen independently by itself and supports the efforts of the Kyrgyz side to safeguard independence, sovereignty, state security as well as to promote economic and social development. Both sides should keep close communication, combat the "three evil forces" including the "East Turkistan" to maintain common security and stability. Both sides should step up the efforts to advance Line D of China-Central Asia natural gas pipeline and other major projects, expand the scale of bilateral trade, strengthen cooperation on electric power, energy, transportation, agriculture as well as between adjacent regions, support educational, academic and cultural exchanges, uplift the level of people-to-people and cultural cooperation. Atambaev expressed that China is a great neighbour and a reliable partner of Kyrgyzstan. Bilateral relations have withstood the test of the changing situation. 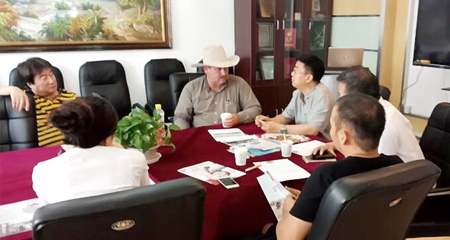 The Kyrgyz side admires China for finding a correct development path. Kyrgyzstan appreciates China for insisting that all countries, big or small, are equal and for adhering to treating its neighbours well and as partners. The Kyrgyz side is grateful for China's sincere support and help. The Kyrgyz side firmly believes that the Chinese people, under the strong leadership of the CPC, will surely realize the goal of the great rejuvenation of the Chinese nation and contrite more to world peace and development. The Kyrgyz side, from a strategic and long-term perspective, attaches importance to strengthening good-neighbourly and friendly cooperation with China. President Xi Jinping's visit will surely upgrade the level of bilateral cooperation and to push for the long-term stable development of bilateral relations. Atambaev expressed that the Kyrgyz side supports President Xi Jinping's proposal of building the "Silk Road Economic Belt". Kyrgyzstan is willing to expand cooperation with China in the fields of economy, trade, energy, connectivity, people-to-people and cultural exchanges, to strengthen cooperation on security, law enforcement and defense, to work together to combat the "three evil forces". The two heads of state agreed to strengthen coordination and cooperation within the SCO, to push for solidarity and cooperation among the member states as well as healthy and stable development of the organization, so as to safeguard peace, stability, development and prosperity of the region. The Chinese side spoke highly of the work by Kyrgyzstan as the rotating president of the organization and supported the success of the Bishkek Summit. Following the talks, the two heads of state signed the China-Kyrgyzstan Joint Declaration on Establishing Strategic Partnership and witnessed the signing of a number of cooperation documents in the fields of economy, trade, energy, investment, financing and traditional Chinese medicine. The two heads of state met the press. Xi Jinping pointed out that the upgrade of China-Kyrgyzstan relationship to a strategic partnership has set new goals for the future development of bilateral relations. Both sides will, taking this as a new starting point, enhance political mutual trust and deepen mutually beneficial cooperation, to better benefit the two peoples. I believe that with the joint efforts of China and Central Asian countries, the "Silk Road Economic Belt" will surely yield fruitful results in the near future.